Pin-Ups for Vet's for your Monday morning! I’m in an Uber driving north, passing by the Hollywood Sign. I am supposed to be headed south. My driver swears he knows a shortcut. Ok, Raffee, we’ll see, bro — but my land nav skills are telling me we’re headed towards a disaster and I’m late. Really late, and this is not the impression I want to send to the woman waiting for me at the famous Hollywood American Legion. I’ve just arrived, thanks to Raffee’s shortcut. He earned his 5 stars today. As I rush to the entrance of the historic building that rightfully looks like a bunker defending the Hollywood Hills, I realize that I’ve just traveled back in time. Before me is a marvelous Pin-Up model posing before a row of flags and one large cannon. She’s got it all. Hair perfectly curled, a vintage-inspired 1940s dress, and a smile that is making our cameraman blush. This is an image that could sell war bonds or find its way onto the nose cone of a B-24. Wow, I just learned that Pin-Ups For Vets‘ Founder, Gina Elise, really knows how to make a first impression. Pin-Ups for Vets Founder Gina Elise at the Hollywood American Legion. Here I am, nervous and fumbling with my bag as Gina takes photo after photo almost effortlessly. She’s a pro. 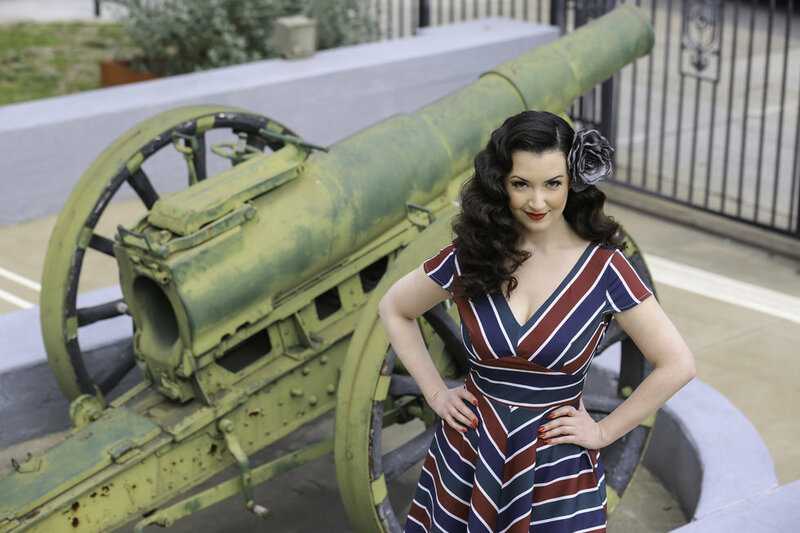 It’s been 13 years since Gina founded Pin-Ups For Vets, a non-profit organization that supports active military and veterans by producing an annual fundraiser pin-up calendar. The Pin-Ups For Vets Ambassadors visit ill and injured veterans in VA hospitals across the country (Gina’s volunteered in 31 of the 50 states). The organization also purchases thousands of dollars of rehabilitation equipment for VA therapy departments. The photoshoot is coming to end when Gina tells me she has a surprise. She’s baked an eight-layer brownie for me and the cameraman. Seriously, is there anything that Gina can’t do? Right now, she’s off to change before our chat. As I bite into the absolutely delicious snack, it hits me that Gina, like the brownie, has many layers that only get sweeter and sweeter. Pin-Ups for Vets Founder, Gina Elise, at the Hollywood American Legion. I’m downstairs at the American Legion. It’s dark and the smell of cigars lingers. This is definitely a place for veterans and is home to some pretty amazing movie history. Just out of the corner of my eye is the long bar where Jack Nicholson had a conversation with a ghost bartender in The Shining. And, just like old Jack, I wonder if my eyes are playing tricks on me as Gina approaches in a fresh new dress. So, what were you doing before you came here? Totally. I am curious about what you do when you aren’t owning photoshoots? GE: I was wrapping up some details for our upcoming visit with hospitalized veterans! I was also trying to see if our CBS News clip was up online yet, so I could share it on our Facebook page. I like to keep our supporters up-to-date about things that we’re doing. GE: I wanted to bring dessert for you guys. These bars have seven ingredients with a chocolate glaze on top. GE: I was also planning a morale-boosting pin-up makeover for a female Air Force veteran. We have multiple projects going on all the time. I have to be a multi-tasker. GE: It’s one of the things that we’ve been doing for a while. We do makeovers for female veterans and military wives as a fun way to give back to them and pamper them. I also just released a casting call for our 2020 calendar. It’s our 14th edition! We’ve received more submissions this year than ever before! What does it take to be a Pin-Up in the calendar? GE: Well, we look for female Veterans who have great stories to share. We ask them to submit their picture, tell us a bit about their military service and why they would like to be in our next calendar and what that would mean to them. Last year’s calendar at the Queen Mary was amazing. It’s still hanging in my office. How do you find these places? 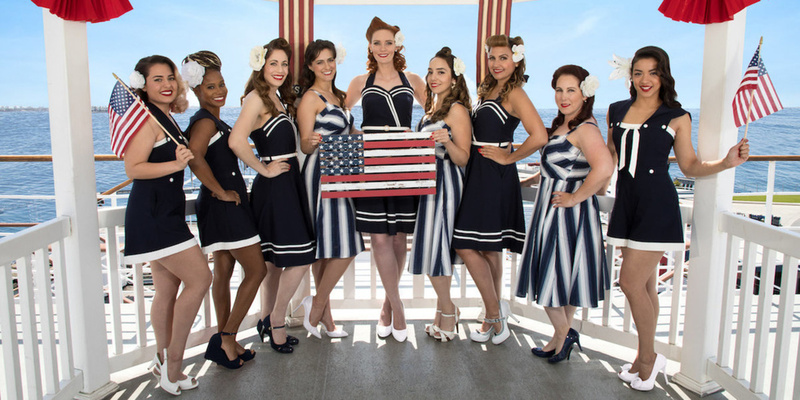 GE: The 2019 Pin-Ups For Vets calendar was photographed on the Queen Mary. Producing the calendar every year is like making a film — from location scouting to casting to styling to pre-production to photography to post-production to editing and printing. It takes months. I want it to be top notch so people want to order it year after year. Many of our supporters collect them, and some have the entire calendar collection — all the way from 2007, our first edition. And you do this all yourself? GE: I have a lot of amazing volunteers, many of whom are female veterans. 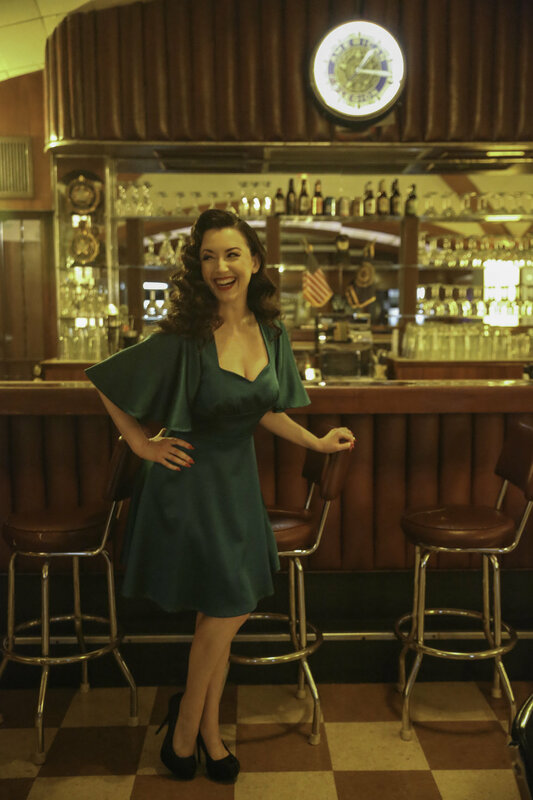 Pin-Ups pose on the Queen Mary for the 2019 Pin-Ups for Vets Calendar. Really? Are you recruiting an army of Pin-Ups? GE: It’s really a sisterhood of volunteers. They are coming together, after their military service, to give back to their brothers and sisters. One of our volunteers recently told me, “I came for the service. I stayed for the sisterhood.” I think that having images of female veterans in the calendar is a starting point to tell their story. Images are powerful. People want to know, “Who is she?” Then, they find out that she is a veteran. It makes people think twice, as it is a common assumption that veterans are only men. The ladies constantly tell me that they are often mistaken for being a military spouse. They are not assumed to be a veteran because their gender. I think that the calendars have started changing peoples’ minds on what a veteran is. You’ve definitely changed my mind. What’s the craziest place you’ve seen your pictures? GE: They’ve gone all over the world. 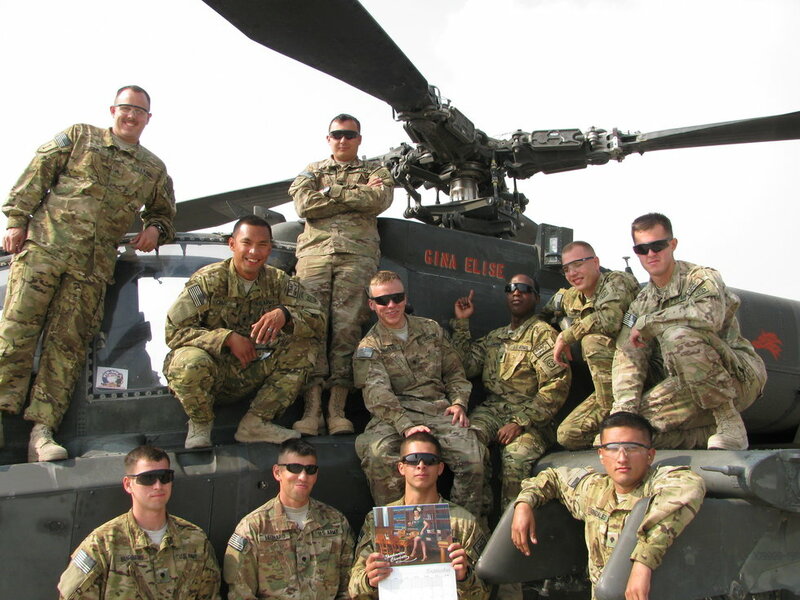 We are constantly shipping care packages to deployed units. I have to ask: has anybody painted you on the side of their Humvee? GE: Soldiers put my name on a helicopter! Ok, that’s pretty cool. I mean, not a lot of people get their name on a helicopter. GE: It was a great picture. Yeah, I have to get that picture. OK? Gina Elise painted on the side of an AH-64 Apache Helicopter. It’s pretty amazing that you’ve used an iconic 1940s fashion style to embrace femininity within the military culture. How do the ladies even start to learn how to be a Pin-Up? GE: The ladies who volunteer with us have adopted the 1940s style so well. They watch YouTube tutorials about how to do their hair and makeup. There’s something about presenting yourself in this vintage style that makes you feel really confident. It’s a beautiful celebration of a woman. It’s really about embracing our femininity. I love how I feel when I get dressed up. It gives me confidence. Really? Confidence doesn’t seem to be hard for you at all. You’re a natural leader. GE: I was shy growing up. Being involved in leadership classes in junior high and high school were life-changing for me. They gave me a sense of responsibility at a very early age, and showed me what I was capable of doing. Maybe that is why I connected so well with the military community — because there is such a focus on strong leadership. A little bird told me that you are a Colonel? GE: Honorary. The American Legion made me an Honorary Colonel. It was incredible. We are so grateful to the American Legion. They’ve been so supportive of what we do. Roger that, Colonel. So, when do we get to see the book of all the Pin-Up pictures? GE: A coffee table book? I’ve thought about that! Our supporters have asked me to do a coffee table book before. I would love to see that! Have the fans asked for anything else? GE: Yes! I actually have an idea for a television show. Oh really? Let’s talk about that later after I finish this amazing brownie. Be sure to visit www.pinupsforvets.com for more info.